If it wasn’t bad enough that demand in the shipping markets has not recovered, commodity price rises have put more than a little pressure on ship operating costs. Fleet owners and managers are certainly feeling the squeeze in 2011. 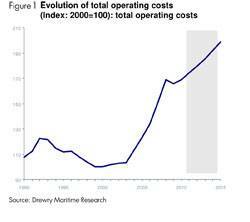 Drewry has just published its latest annual analysis of ship operating costs, covering 8 vessel sectors and over 35 different sizes of vessel plus detailed operating budgets for a range of oil tankers, chemical tankers, gas carriers, dry bulk vessels, container vessels, ro-ro, general cargo and reefer vessels; making it the most comprehensive survey of this crucial area of vessel management. - Manning – the key change here is that low market demand has kept wage levels down across the globe. This has also had the effect of narrowing the gap between demand and supply for experienced seafarers... a continual problem over the last few years. However, as more newbuilds come on stream, the gap will no doubt widen again forcing wages up. With the next STWC round as well as ILO MLC regulations cutting in next year, owners and managers will come under wage and staff cost pressure – particularly in the areas of travel, training and victualling. - Insurance - in H&M, premiums have barely risen. Vessel values have become more stable following the drop in recent years, the outlook points to premiums rising to reflect the pressures the insurance market will find itself under following non-marine related claims, such as the earthquakes in New Zealand and Japan. - P&I cover in 2010 saw standard surcharges falling to an average 3.5%. Stock markets rallied and so this had a positive effect on P&I rates. The exception is the offshore sector where increases of up to 40% in P&I rates have been reported. Deepwater Horizon has been the main cause and the problems this year. Excess loss reinsurance rates, on the other hand, were reduced for all vessel categories. - Repairs & Maintenance – the increase in commodity prices, particularly steel, has had an effect on the cost of R&M. But rising oil prices has meant more expensive lubes, paints and coatings. In a difficult market, owners and managers have been looking for the best prices and increases in yard capacity, mainly in China, have helped this cause. - Stores & lubes – once again there is a concern that lube prices could become disconnected from oil prices and so a significant increase in lube prices could be on its way. Those owners and managers that had pinned down lube prices with forward contracts may find those agreements run out this year and so the cost benefit will likely disappear. - Management & Administration - regulatory issues loom largest in this cost area. SOLAS Chapter V stipulates that Electronic Chart Display and Information System (ECDIS), along with Bridge Navigational Watch Alarm System (BNWAS) must be fitted to all new vessels immediately and will affect all ships in time. Tighter Sulphur Emission Controls for vessels sailing within SECA areas came into effect last year. This raises fuel costs and has made record keeping on ozone depleting substances on board mandatory. Fleet operators know that the many conventions that abound on safety, emissions and manning will result in increased costs. Like low demand and high commodity prices, regulation is a brutal fact of maritime life.